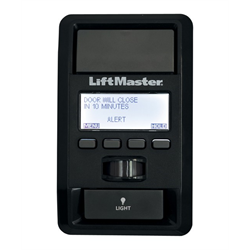 The LiftMaster 880LMW lets you take complete control of your garage. This Smart Control Panel features an intuitive menu-driven design for easy programming of remote controls and setting adjustments. Get system diagnostics on the unit’s display screen and look through menu options. The 880LMW also comes equipped with a motion sensor that has a 150-degree sensing angle which can be programmed to turn on Garage Door Opener lights when movement is detected so you don’t have to worry about stumbling in the dark when coming home at night. The Timer-to-Close option automatically closes the garage door after a pre-programmed amount of time, so you never have to worry about if you’ve left it open while rushing out to work in the morning. In the event that you’re away, external remote control signals can be disabled to prevent anyone from getting inside.